This is recreation of a 17th Century deck in the neo-classical style by G.M. Mitelli. The boxed deck includes 62 full color cards housed in tri-section fabric-covered bookspine box, inside a lift-lid cardboard box. The explanatory booklet is in German only. It is a limited and numbered edition of 999. Mine is number 694. It is a licensed edition and the cards are the same as in the Grafica Gutenberg edition. 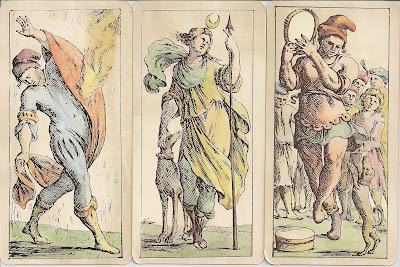 The Tarot created by Giuseppe Maria Mitelli around 1660-65 it is rather a variation upon the Bolognese tarot than a classical example of it. This is because, although the subjects are the same as the ones found in the Bolognese pattern but the execution of them is very different from the original. On the ace of cups is the coat of arms of the Bentivoglio family, for whom these cards were made. Lettered on the ace of coins is "Gioseppe Maria Mitelli Inv. Dis. E. Int." 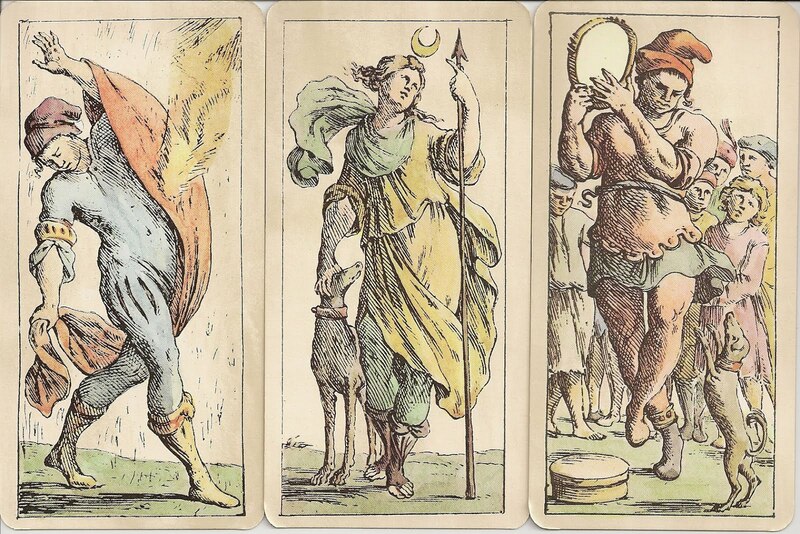 The number cards are essentially pips, but the artist embellished them with lots of symbolic detail. The ten of coins, for example, shows ten copper coins each depicting a different activity: hunting, archery, etc. The seven of coins shows silver coins with gargoyle-like face charicatures on them. On the nine of staves the staves are tied together in an odd pattern, and a bird sits on the lower group, perhaps unable to get past the snake to roost on the top. The ten of staves shows the snake gone and the bird eating fruit from the top staff.